It has been 2 years since Jan left, and still his life inspires me. His calm nature and quest for knowledge has made a difference to so many in so many ways. 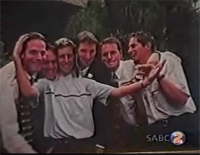 SABC 2 religion and Issues of faith commisioned Jan's father to create a programme about him. This programme is now available for download [206 Mg] from this page. If you would like to leave a message to Jan's family and friends, please send an email here. I wish to thank the producers at SABC 2 religion and Issues of faith for allowing me to distribute this programme to everyone on the net. Jan Horn passed away 06 June 2002. Friends and family alike will miss him dearly. To my Mentor and Friend. You are the most intelligent person that I have ever met. we will miss you bitterly. No words can explain our loss, we miss you our friend. You're the most beautiful and gentle person I know. Go well my friend. So calm, so wise behind your years. You'll never know how much I appreciated having you sitting next to me share your passion for life and computers. I'm trully going to miss you Thanks for playing with us and thanks for living with us. Jan Horn. The living definition of "The Ghost in the Machine". So silent, yet so powerful. May you live peacefully in whatever 3D world you created. I shall remember you every time I hear the silent hum of a computer. And to the angels, "Don't fear the Reaper", for he has been one of you since birth. Jan, my wise friend, everything you touched turned to gold, and you have touched each and every one of us in a very special way, no book, nor nobody else could have tought us the things you tought us : How to be humble, how to take life one step at a time, and how to sit back and smell the roses. Go well. My Friend, i'll miss u so much, whom i going to play quake with, i'm lost. You've left me with so much, And i'll miss your smile. Luv you lots. See u soon my friend. To my gentle whiz kid - May you rest in peace. May you have moved on to better things. The world is a poorer place without you, go on proudly and peacefully. Although our encounter was brief, your smile made a large imprint in my memory. When I reminisce about my long holiday back home I will remember you fondly as one of the good time guys. It was a privilege to have boogied with you mate! All the strength and love to your family and friends. Peace. Jan, thank you for the gifts your life brought us. Thank you for putting up with my noise in direct contrast to your peace and quiet. Your gentle way and kind heart touched me and I will miss you. Your life was an example to me. May your future journeys be filled with joy and love. If i had to go find Jan now I would look for him in the moment that exists where light and dark meet. We shared that place once before ontop a mountain in drakensburg. Jan is one of the few beings with whom i never felt that we where just monkeys making noise , a peaceful warrior in whoms presence we could sit like cats silent. I will always carry a small part of his calm being within my soul. And as my own short life continues my mind and heart will miss him ,but I know deep within our soul that he is ever with us. I cherish all the moments we shared together in this life. May your soul be looking across the vast expanse of infinity right now. Thank you for choosing this time and place on this world to share your love with us. May love and light go with you. It is very apparent that there is not one life or person that Jan came into contact with that wasn't profoundly affected by his incredible gentle and enlightened way. I will treasure the time I got to know him and will hold dear the memories of the laughter we shared. This world is that much more beautiful for knowing such a special entity like Jan. Thanks for sharing your smile with us all. Jan, I know you are safe and protected and watching over all of us. To the family, I wish you all the love and strength during this diffcult time. We will all cherish his memory. The most genuine person I've ever met. Dear Jan, I've never met you, but I've already considered you as a friend because when I needed help in coding, your tutorial is always available. Your code shows sweetness, beauty, and intelligence. I'll miss you--a friend I've never met! Whereever you are, I am pretty sure it is a beautiful world. Peace to you and your family. Go well friend. I know you are now in a place that is warm and safe. We will miss your companionship, calm presence, and smile. We will always hold a place for you in our hearts. Jan, you are truly a special and gentle soul. We will miss you dearly. You will always be in our hearts and minds. My friend JanHorn, you inspired the community with your skill, and you were a great guy all round, a real role model for aspiring programmers to follow. Never letting go of your legacy and passion. Jan, I will truly miss you. You have been an inspiration to all you have come into contact with. Your pure heart and Love for life have made you truly special. Blessed be. Jan, I firmly believe you were always the secret weapon here at the 'b*x. You will be sorely missed and I feel robbed that you were taken away so suddenly without us having the chance to become better collegues and true friends. Your spirit, beauty and gentle nature will always be present. Heard about the tragic news; my thoughts are with Jan's family and friends. Jan, you've clearly touched many lives and you'll be remembered forever. Rest in peace. No words can express the sense of loss I feel for Jan. Although we only exchanged a few e-mails, I am a frequent visitor to his site. He has been a constant inspiration for a whole lot of people out there. His memory will live on in our minds, and the code he wrote. Whenever I moaned at a developer, complained about someone's code, got annoyed at a persons over-inflated ego or hoped for someone more capable, I was mentally comparing them to you. You unknowingly set a difficult standard for anyone I've worked or played with since. Your kind thoughtful nature never failed to suprise. I'll miss every facet of you Jan, and so will many others. ~ Janice, Dario and Luca. You have been an inspiration with your web page to programmers around the world. Your code was the code I would always point people to as the correct way of doing things. You will be missed. I will miss you! I have known a lot of people in my life, you are one of those people who has made a difference in mine. Your hard work and humbleness will never be forgotten. It was very sad to hear about this news. May your memories always be cherished. I only knew Jan from the website and a couple of emails that I sent to him, but this news has struck me deep. Jan was a genius in his own right and it's a tragedy that we will no longer see this genius at work agian. I am at a loss for words, I cannot express enough my deepest condolences to your family and friends, I only knew you for a short period of time, but got to know you as a kind, gentle and compassionate person, who had a zest for life and talents to match the best of them� This memorial site is a testimony to your nature and the impression you made on all those who came to know you! The world will miss you Jan, as will I! Farewell! I will always remember Jan as a kind and very humble person, who was always willing to help out no matter how much was on his plate. His incredible technical know how combined with his quite yet bubbly personality will be sorely missed by all of us who's lives he touched. Your spirit lives on Jan! We always remember you with pride and loving admiration! Brett en ek het al 'n lang pad saam geloop, en deur Brett het ek Jan leer ken. Leer ken as 'n briljante mens met 'n groot toekoms, gedryf deur passie en waarvoor hy lief was. Leer ken as 'n saggeaarde, liefdevolle en nederige mens. "His departure left a void". Ons almal sal hom mis. You taught me almost things i know today. Thanks for your patience, thanks for having been nice, thanks for all! Wherever you are, please keep coding, to show me new stuff : don't forget we have to play Quake!! my wish was to show you the last release of my demo, you liked the begin... i will show you it anyway ! you will be proud of me. Your wisdom was an inspiration to us all. The pain which results from the disappearance of a person that we love cannot explain by simple words. sorry, for my bad english, but it's even hard to explain in my native language what happens. I just got the message that Jan died and it really shocked me. I don't know him personally, but had sometime mail contact with him and of course also know a lot of his opengl work, he did for all of us out there, with all the enthusiasm and creativity - always trying to offer others a good source for information. To my invisible mentor. South Africa is a duller, more bland place without you. I will miss your words of advice, your vast wells of help and most of all, you. Jan, I had only a few contact with you by email but I could see a person who was always gentle and eager to help everytime! I and all the community will miss you too much. Every time I use OpenGl I'll remember you. Shall God bless you with peace wherever you are mate. Your Works are talking about you, we are so sorry here in Arab World. We are a french student group, you are still a model for us. Your tutorials were an inspiration to us all. You give us your passion, we will always hold a place for you in our minds. I never met Jan, nor even exchanged emails with him, but am one of the many many aspiring Delphi/openGL programmers from around the world who visited Jan's site and benefitted from him sharing his knowledge with us. His generosity and willingness to help others were an inspiration to us all, as well as a credit to his parents. He inspired us to aim high, and to also help others in our turn if we can. I was shocked and truly saddened to read yesterday of his passing. He will be greatly missed by us all, but his memory will live on. Vale Jan, friend of the world. There are a million things running through my mind right now; pain, sorrow, anger, regret ... but as time passes, the only memories I will have of you will be good ones. I'm going to miss you more than I ever imagined. Farewell and take care. I'm at a loss for words. Jan, you will be sorely missed. The day I met you, you changed my life. You opened doors for me which would have stayed shut, and were always a kind, gentle and approachable mentor. Thank you. If you would like to leave a message to Jan's family and friends, please send an email to here.